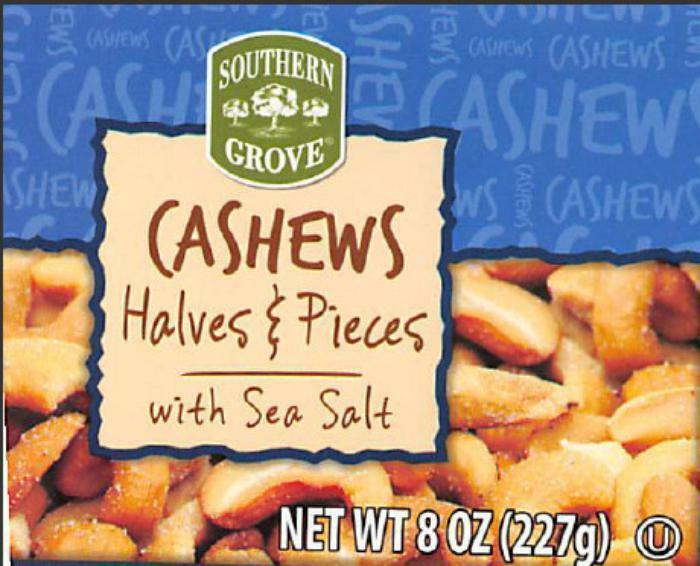 Star Snacks of Jersey City, N.J., is recalling two lots of Southern Grove Cashew Halves and Pieces with Sea Salt due to the potential presence of glass pieces. No injuries have been reported to date. The recalled product was sold by ALDI stores in Alabama, Arkansas, California, Florida, Georgia, Iowa, Illinois, Indiana, Kansas, Kentucky, Maryland, Michigan, Minnesota, Missouri, Mississippi, North Carolina, Nebraska, New York, Ohio, Oklahoma, Pennsylvania, South Carolina, South Dakota, Tennessee, Texas, Virginia, Washington, DC., Wisconsin and West Virginia. Customers who purchased the recalled product should not consume it, but dispose of it or return it to their local ALDI store for a refund. Consumers with questions may contact Star Snacks at 201-882-4593 Monday-Friday 9 am – 2 pm (EST), or by email at RecallFEQ01@gmail.com.